DRM: Disc check once per several days. 2 Online multiplayer services have been discontinued. In some systems, pieces may not be drawn correctly in True3D mode. Press Ctrl-Alt-Del to bring up the task manager menu, and press ESC to return to Chessmaster. Use a non-True3D setting (these boards aren't scaled, and will look small on high-resolution monitors). Use a "flat" piece when using True3D. You may get an error message "A fatal error occurred when loading the Mentor Opening Book. The application will shut down.". As found in Windows 7, this may happen when running an account other than the one in which the program was installed. 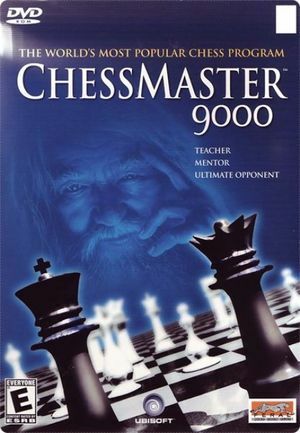 So the administrator account may not show this error when running the program, but when running from a different account such as a limited user account, the error may show since a copy of the Chessmaster 9000 folder is not created in that users profile when running (only the administrator account has a copy). If you receive that error message, Mentor.obk is missing from one of those two folders. Find it in one of the main Chessmaster subfolders, then copy it to the corresponding folder.